Valve and HTC Are Co-Operating On Half-Life? It doesn't take much to get gamers excited about Half-Life 3. After all, the community's been waiting on a sequel for nearly ten years. But today, an off-the-cuff comment from the HTC chairwoman has the internet holding its breath. Half-Life 3 feels closer than ever. Yesterday, HTC announced it would be joining forces with Valve on a virtual-reality project called "Vive." The VR headset is a direct competitor to the Oculus Rift but includes a slightly beefier set of specs. Plus, Vive will hit the market around Christmas, and the Rift doesn't have a release date at this point. Valve probably forged this cross-company friendship because HTC has a much more robust manufacturing network. Valve's background is in software development, so actually constructing a consumer product is outside of Valve's expertise. And the opposite is true for HTC. So, when a BBC reporter asked HTC co-founder Cher Wang to comment on the likelihood of Half-Life heading to Vive, she probably didn't know the answer. Initially, Wang evaded the question by turning the conversation toward Dota and Team Fortress 2, but the reporter wouldn't let her off the hook. BBC: One of Valve's most famous games is the Half-life series, and I know there are millions and millions of gamers that are desperate for a new Half-life game to come out. Is the new Half-life going to be on the virtual-reality headset? Is that what Valve is going to do with this machine? Cher Wang: I think Valve's best game is Dota, right, and Portal and [Team Fortress] and I think they are very keen to have them. BBC: But how about Half-life - is that going to be on there? Cher Wang: We are co-operating with Half-life, and I think... I hope, you know, it will be on it. That doesn't sound like a confirmation to me. It sounds like a person who's trying to generate exctitement about a product without knowing everything that the folks at Valve are hiding behind their backs. 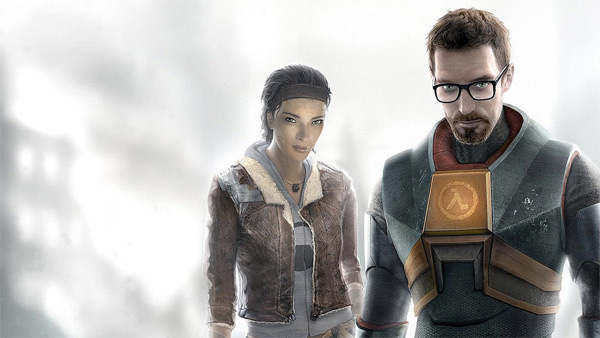 Speculation about a Half-Life 3 reveal has come to a head over the past few days. Valve is scheduled to give its GDC presentation tomorrow at 3pm. Get it? March 3rd at 3pm? 3/3/2013? That's a lot of threes. Hey, do you know what else has a three? Many players are convinced that this is Valve's clever way of hinting at the game's impending release, and Wang's slip of the tongue is just further evidence. But the fact that Valve sent a "beta" version of Half-life 2 to Oculus Rift developers in 2013 makes me wonder if Wang was referring to some kind of virtual-reality rerelease for Half-life 2. And Valve has been heavily focused on hardware lately. Aside from the Vive, the company is working on a new control pad, a PC-based console, and some kind mysterious virtual reality controller. So, Half-Life 3 might not be at the top of Valve's priority list. Plus, Gabe Newell isn't even going to be there. Developer Sergiy Migdalskiy is giving the presentation. And do you really think Newell would miss the Half-Life 3 reveal?